I’m back again this morning with my second Crafts-U-Love DT card. Links to the supplies I used are at the end of my post. I was delighted to receive a couple of John Next Door dies in my package this month and used them again this week to create a quick Christmas card. I created the background using some distress oxide inks and then added the die cut images to the base of the card. To finish off my card, I added a sentiment by John Next Door. If you decide to buy any of the products I’ve used after reading this post, please let Crafts-U-Love know by using the drop down menu on the checkout page and selecting ‘Design Team’. Please note this is simply to help Crafts-U-Love and I do not receive any compensation if you choose this menu option. I do not use affiliate links. It’s been a long busy week with no time for crafting. Hoping to carve out some time to get crafty today… but first I want to share my next DT card for Crafts-U-Love! I was delighted to receive a couple of die sets from the John Next Door Christmas collection this month. Aren’t they pretty? I couldn’t wait to use them. When I sat down, I spotted a couple of bottles of Nuvo Shimmer Powder that I bought a few weeks ago and still hadn’t tried, so I decided to use them to make a background rather than my distress inks. As I knew I’d be adding a TON of water and heat drying the background, I decided to use watercolour paper and taped it to a wooden chopping board I use when I create inky backgrounds before ‘painting’ a coat of water. I’ve since tried the powders on regular cardstock and they work just as well, although the card did get more warped during the wetting/drying process. I then gently sprinkled the powders randomly across the paper. A little goes a long way! Step 3 – spritz with water/blot as desired! The pigment from the powders didn’t flow as much as I wanted as my paper had started to dry so I spritzed water onto the paper to spread the pigment a little more across my background. I added a few more sprinkles of powder where I had a lot of white and then started to dry the background with my heat tool. I also blotted some of the ink to lighten the background a little. I ended up with a very shimmery paper towel and was worried that I’d removed the shimmer from the background. I needn’t have worried! The background was still super shimmery! Once I finished the background, I started to assemble the card. At this stage, I was still planning to make a shaker card so I cut a square frame and adhered the die-cut snowdrifts to the top and bottom of the frame. As I was holding the frame against the background, I realised that the shimmer wouldn’t be as obvious in a shaker so I decided to simply frame the background instead! I cut down the background and adhered the frame using foam. One of the snowdrift dies from John Next Door also includes a single whole snowflake so I cut that MANY times and stuck them across the card. Then I added the fabulous sentiment. I was originally going to use the sentiment cut from mirror card, but when I tried this against the background, I thought a white die cut would stand out a little more. So I cut the sentiment from white cardstock a few times and adhered them together before adding it to the card. I wanted to add EVEN MORE sparkle so I applied some Nuvo aqua shimmer to the snowflakes and sentiment and some gems across the card. After all, you can never have too much sparkle and shimmer can you?! It’s time for a new challenge over at AAA Cards and this fortnight we are challenging you to use a stencil. Our sponsor is Stamplorations. I love stencils. The price point is great and you can do so much with them. Great for quick and simple cards and I often use part of a stencil to ‘ground’ an image in my CAS cards. My stencil collection has grown a lot over the last couple of years! For my take on the theme, I decided to use a stencil by John Next Door as a main focal point for some quick CAS Christmas cards. A few weeks ago, I bought some Ranger detail blending tools – they are tiny and perfect for detail stencilling! 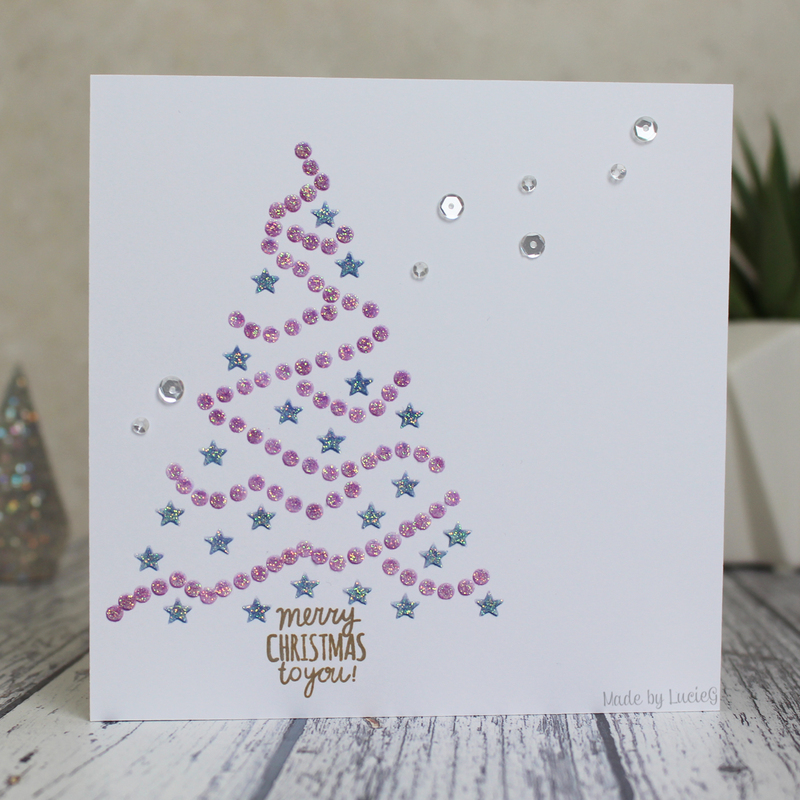 They made it very easy to use different distress oxide inks on parts of this stencilled tree! After inking the image, with the stencil still in place, I coated the tree with Cosmic Shimmer sparkle texture paste. It was quite interesting to see how the paste changed the colour of the underlying distress oxide. For example, I used Dusty Concord for my second tree, but I think it looks like Seedless Preserves, don’t you? Once the glitter had dried, I stamped the small Simon Says Stamp sentiment to create a tree trunk! My teammates have shared some gorgeous CAS cards on the AAA Cards blog and we are also joined by our wonderful sponsor, Sherry, plus the super talented Hannelie from Desert Diva and Steph from Morticraft as our Guest Designers. They have some fabulous creations on their sites! I’m also entering my green tree card into the current CAS Christmas challenge as the theme is ‘tree’. It’s the 15th which means it’s time for my next Crafts-U-Love DT post. This month, I received some butterfly themed supplies including this pretty set by John Next Door. I think I took it upon myself to try to use as many of those pretty stamps as possible on one card! This card actually came together very quickly for me and I think I ended up finishing it in 20 mins or so! That never usually happens! I tend to always reach for my MISTI when using clear stamps, but for this card, I used clear blocks – which are much quicker. I used distress oxide inks – love how well they stamp. To finish off the card, I added a Penny Black sentiment and a few gems.